“Barnsboro Inn is pleased to offer an enthusiastic recommendation of Patrick Phillips and his company, Phillips Janitorial Services, Inc. In the 13 months or so that we have relied upon Patrick and his staff, we’ve found them to be extremely professional and quickly responsive to any requests. I highly recommend Phillips Janitorial Services, Inc. Should you wish to speak to me directly about our experience with this company, please do not hesitate to call." “This letter is written regarding Phillips Janitorial Services Inc. who has been providing cleaning services for our office building since Sept. 2008. The office building consists of 3 floors with 10 offices, 2 conference rooms, 2 kitchens, 4 bathrooms, and 8 office work cubicles. In addition there are several hallways and common areas for storage and supplies. Phillips Janitorial provides service for all these areas and well as responsibility for our recycling efforts with emptying trash etc. Over the past four and a half years, Mr. Phillips has shown he is committed to providing quality cleaning services. I have also referred clients to him who have homes preparing for sale or other cleaning services needed and they too, have also been pleased with his service." – Wanda Lee McIlvaine | Budd Realty Inc.
“It is with great pleasure and confidence that I would recommend Phillips Janitorial Service for your cleaning needs. We have had this service for all five or our facilities for several years. The owner Patrick, takes extreme pride in his work and gives 110% every cleaning. Our offices are always up to par with regards to cleanliness but if ever there was a challenge or special need all it takes is one phone call and he will show up personally to fulfill whatever request you should have. I work in an industry where customer service is key, and with all honesty I can state that the service and cleaning we receive from Phillips Janitorial Service is always taken the extra mile. Should you have any further questions, please feel free to call me." “Phillips Janitorial Services provides Janitorial cleaning to Camden Yards Steel Company for the past year. Mr. Phillips and his staff are professional and courteous and do a fine job. If there are any special requests or any cleaning related issues they are taken care of in a prompt manner. Phillips Janitorial also provided floor service to Camden Yards Steel Company consisting of stripping and waxing and the floors looked like new again. 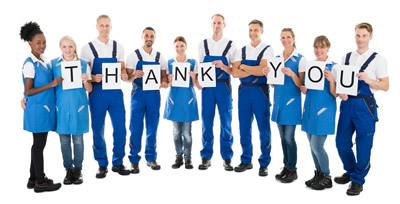 We appreciate the good work and highly recommend Phillips Janitorial Company."